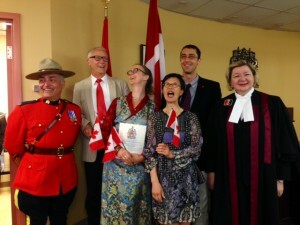 On Tuesday morning July 8th, Shambhalians Dorothee Rosen, Hung-Yeh Peisinger, Charles Kalinsky, and Ron Renz took the oath of Canadian Citizenship before Judge Ann Janega in downtown Halifax. 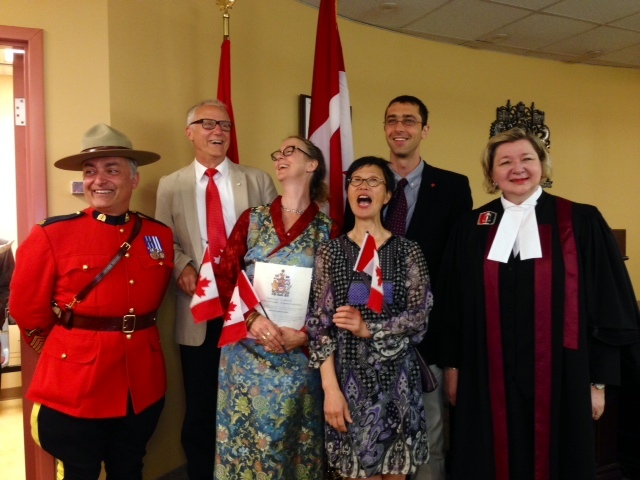 The lungta was palpable, and the room was abuzz with excitement as we joined with 44 other “new” Canadians from around the globe for our ceremony. Neither of us knew that the other Shambhalians would be participating in this ceremony, which added to the joyfulness of the occasion. Several Shambhala friends and family came to cheer us on. Tears of joy were shed. Judge Janega reminded us that July 1-7 was Canada History Week as we gathered across form the historic Town Clock and the Halifax Citadel. I recalled the flag of Shambhala flying high over the Citadel during the lhasang before the their Majesties, the Sakyong’s and Sakyong Wangmo’s wedding day. Each of us had our own stories of coming to Kalapa.Dorothée arrived from Germany 25 years ago (almost exactly to the day), to take a position as an au-pair in the household of Peter and Patty Livingston in Halifax. Having grown up in a small Bavarian mountain town, Dorothée had never even heard off Buddhism! The introduction was fierce and swift: Thrangu Rinpoche and Ani Pema Chodrön were amongst the visitors to the home, and a steady stream of sangha came and went while Peter was lying on his deathbed. The neighbours were David and Martha Rome, the MacKeevers, the Liefs, Cashmans, and the Johns. Shambhala was inevitable. Dorothée went on to study art at Halifax’ NSCAD University and today runs her own business as a goldsmith. She still lives in Halifax, with her partner Sam West, and daughters Natalie (21) and Emma (18). Charles’ path landed him at Gampo Abbey, Cape Breton, Nova Scotia after finishing a geology degree. He was searching to immerse himself in a rich lineage of wisdom. His family always laughs, “You went to spend the summer and stayed for three years.” He would say that he landed at home. After living in Nova Scotia for nine years, Charles is off to pursue his budding nursing practice in the Yukon. He will miss Nova Scotia for its warm people and beautiful landscape. Ron first connected with the Great White North by hitchhiking from the Vermont border to Vancouver in the ‘70s. After entering the sangha in Atlanta in the ‘90s, he came to Gampo Abbey for a work-study residency and returned in 2001 to attend shedra. From Gampo Abbey and service as Co-Director of Dorje Denma Ling, he is now proud to be serving as a trustee of the Mother Lineage Fund for Atlantic Canada. Ron continues to enjoy the many micro-climates Nova Scotia has to offer from the Valley to the ocean to the Highlands while teaching physiotherapist assistants at NSCC. It’s home.